Fort Ord was named for Major General Edward Ortho Cresap Ord, a mustachioed mathematical genius, rumored descendent of King George IV and veteran of the Seminole, Indian and Civil Wars. Ord first came to California in the company of William Tecumseh Sherman and Henry Halleck, sailing around Cape Horn in 1847 to the Presidio of Monterey, where he served as First Lieutenant. The gold rush-inflated cost of living forced Ord to take a second job as a surveyor to supplement his army income, eventually mapping much of what would become the city of L.A. His Plan de la ciudad de Los Angeles is one of the few documents available to historians documenting the mid 19th century Pueblo of Los Angeles. He retired from the military in 1880, aged 52, and picked up a contract job building railroads in Mexico. En route from Vera Cruz to New York in 1883, Ord contracted yellow fever and died in Havana. The Fort occupies roughly 28,000 acres of prime California beachfront. That is the size of San Francisco, give or take a few miles. Monterey Bay hooks around to its south, giving the intrepid sand dune climber a magnificent view of the city and ocean. Fort Ord has its roots in the First World War, part of a massive expansion of the US Armed Forces. Faced with swelling from 200,000 regulars in 1916 to 2 million draftees in a space of two years, the Army purchased immense tracts of land across the nation, including the 15,000 acre Gigling Reservation that would later become Fort Ord in 1933. General “Vinegar Joe” Stilwell, so named for his notoriously quarrelsome nature, oversaw significant expansion of the Fort in August 1940, a response to the growing threat of war. Fort Ord swelled from 15,000 to 20,000 acres and the 7th Infantry, nicknamed the “Bayonets,” was reactivated and stationed there. German prisoners of war, brought back by the thousands from the European theater after D-Day, were used to build new bunkers and walls. North and south, the cities of Marian and Seaside sprung up to meet the Fort’s increasing housing and service needs. In the post-war 1950s, Fort Ord began to be repurposed as a training facility, a role it would occupy for the next three decades. The Fort’s importance increased dramatically during the long years of the Vietnam War when it became the chief training center in the nation. [It was also the first racially integrated base in the nation]. In the face of escalating public opposition to the war in 1969, Fort Ord closed itself to outsiders. In 1970, after Nixon’s expansion into Cambodia, 3,000 demonstrators were turned away from the Fort at rifle point. 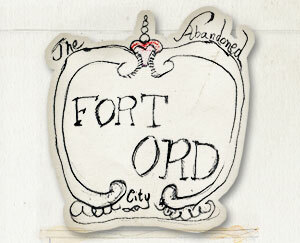 Foundling, Steven and Andy Warner, Fort Ord: A Chapbook Adventure into the Ruins of the American Military-Industrial Complex, Indrind Press, 2008.